I am always in rush–even when I am not in a hurry. Because living in a city if you don’t move, you get run over. There is a frenetic energy in cities that make them simultaneously exciting and exhausting. A side effect of living with constant stimulation is that after awhile a sense of madness creeps in and becomes imbued into your being, and you carry that energy with you wherever you go. But every now and then you arrive at a place that slows you down and quiets the orchestra of thoughts rumbling through your head. Byron Bay was such a place for me. Byron is a beachside town in the northeastern corner of the Australian state of New South Wales. 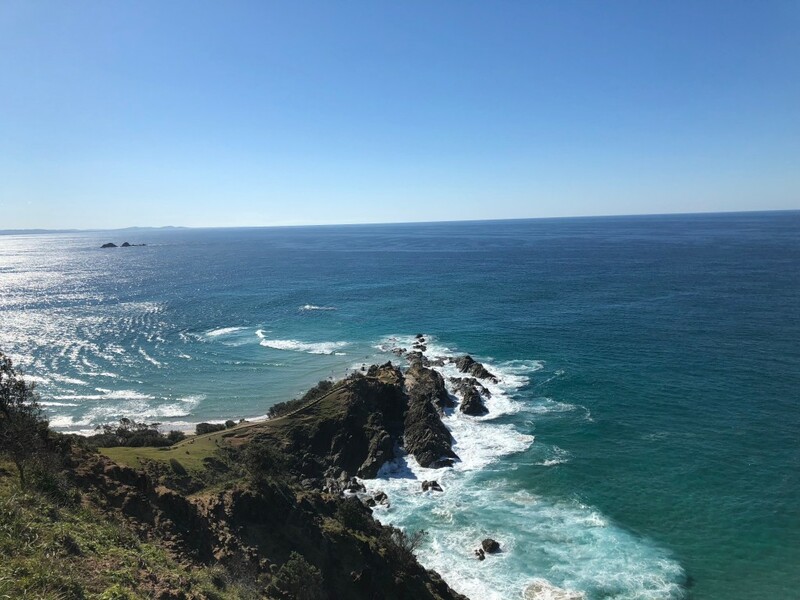 If you make your way up the headlands to Cape Byron Lighthouse and follow the bend you will arrive at the most easterly point of mainland Australia. High up on the clifftop you have a vantage point that allows you to look beyond the wild blue waters yonder and reflect onto the bright golden rays that split through the clouds and rain down light. The cerulean glow of nature seem an odd companion to downtown’s high-end boutiques, cold-pressed juice bars and coffee shops dripping in hipster. But it all coexists, and it is a beautiful contradiction. As such, the hippie chic and the salt of the earth people have both found themselves called to Byron and the hinterlands for the pleasures of la vie boheme. It is easy to see why— it is a place for the wistful and the searching. But there is something more primal that made so many, including myself, connect with this place. There is a grounding energy that you encounter when you arrive there that is almost inexplicable. For the native Aboriginal people this feeling is not unknowing, because this is sacred land that is rooted in their past. Byron was known as Cavanbah, which means meeting place, to the Arakwal people of the Bundjalung Nation. It is the spot they came to for thousands of years to heal and to give birth​. I​t is also the home to the ​ancestral spirits​ responsible for the creation of nature and humanity.​ In Aboriginal Dreamtime the spirits rose from the Earth to create Country. The gave life to ​a​ blank canvas and formed rivers and mountains​ and​ ​made people, animals and vegetation​ to be part of the land​.​ And when ​their work was done, they returned ​back to the Earth​. ​It is for this reason that the Arakwal people live by the land and for the land and never take too much. That what I felt for Byron was somehow the spirits of the Earth I cannot be sure. But there are some experiences that make believers of us all.